More than 85% of flowers for celebrating sold in Japan are dealt via markets. Therefore freshness of flowers is dispaired, and flowers wither quicker which means there is less time to enjoy the flower. Furthermore, there are several layers of brokers in the markets and the price tends to be cheper for producers and higher for customers. It is also said that high-quality flowers do not circulate in the market. 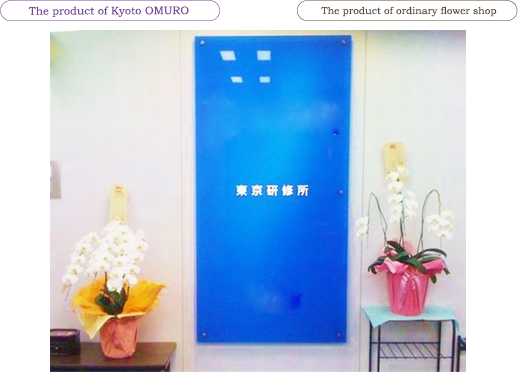 Kyoto Flower Shop OMURO introduced direct-delivery model, we provide customers with high-quality flowers for gifts in pretty fresh condition with decent prices. 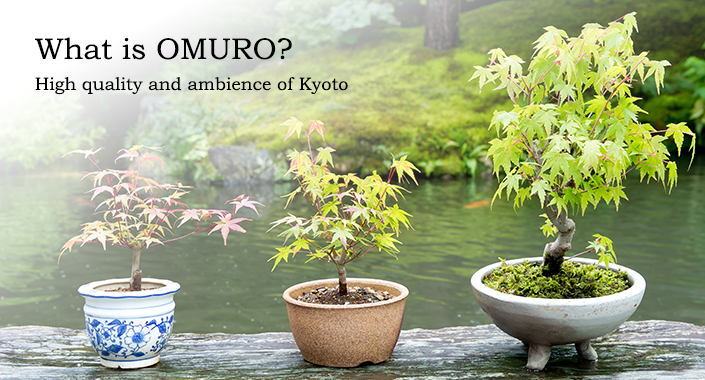 Kyoto Flower Shop OMURO has a tradition of over 55 years of experience as a flower shop. It makes us possible to deliver flowers which are not sold elsewhere by using our original networks. 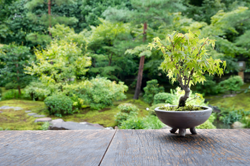 We also sell original products such as Kyoto Mini-Bonsai whose name is after Kyoto's site. In spring, we offer Kyoto Sakura (Mini-Bonsai) by countre-selling at Kyoto Ninnaji (a world heritage). 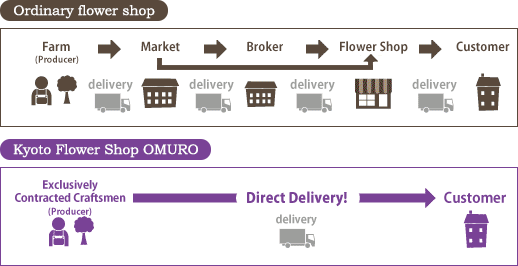 Kyoto Flower Shop OMURO has been continuing to sell flowers over 55 years through which we had transactions with more than 10,000 companies. 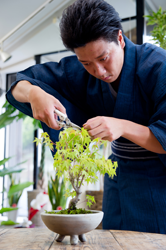 We have a tradition which is assured by Kyoto Ninnaji (a world heritage) as well as our costomers in the past. Kyoto Flower Shop OMURO cherishes the mind of OMOTENASHI. Beginning with rankings of popularity and recommendations hepling customers to choose flowers, we also support customers with several advices such as recommendations of celebrating flowers and even how to grow flowers. We also accept personalised requests such as special wrappings and gift cards. On our SNS pages such as Facebook, we post useful information about flowers, introduction of birthday flowers for example. We deliver flowers from the farm, which are raised with clean water and air, under proper temperature until a day before the delivery. The picture of Phalaenopsis orchid after one month of delivery. Our contracts are made exclusively after visiting producers all around Japan, checking several factors. 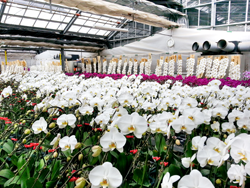 The producers have experiences of several awards of phalaenopsis orchid. 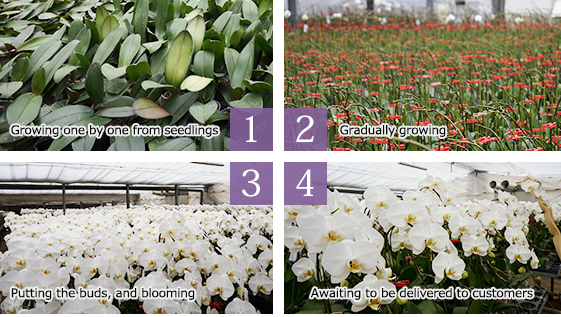 We can confidently recommend our flowers as they are grown carefully one by one, under proven producers.